Moving places can be easy and efficient, as long as you have enlisted the right help. In this case, the right help will come from Removals Silvertown – the local removal experts. We deal effectively with pretty much all types of domestic removals and business removals without costing our customers a small fortune. We also provide specialised services like piano removals, office removals, furniture removals, junk and rubbish removals and many more. A professional packing service is also available through us, if customers wish to self-pack, which is also an option, we will be able to deliver the necessary packing materials at a very reasonable price. Being a professional and well-established moving company we know the importance of safe handling and no-damage transportation of items in our care. This is why we employ only specially trained movers and experienced drivers all of whom know their work inside out, and will handle all aspects concerning your relocation with professional pace, precision and efficiency. Since you won’t have to go through the stress and hassle of organising and handling your own removal (as we will do that for you) why not spend some time in touring some of London’s nearby landmarks. You are better off checking out other parts of the city, as Silvertown is former industrial district and there is not too much to see and do there. Much of the area has been regenerated for residential purposes but some of the industry still remains. Silvertown has no ancient etymology behind its name, as one gathers. The district was named after the founder of the former rubber factory which was active there during the second half of the nineteenth century, his name was Samuel Winkworth Silver. Currently, there are two major industrial complexes active in Silvertown and these are the Tate & Lyle sugar refinery and the John Knight ABP Rendering plant. There are plans to regenerate fifty acres of former docks and industrial estates on the south side of Silvertown Quays. Our man and van company specialises in both domestic and commercial removals in Silvertown. We have full CMR insurance because we want our clients to have the peace of mind that they are working with responsible moving experts. However, please note that to this day we have never activated our insurance policy as we always emphasise on security and take all the necessary precautions to ensure the safety of the moved items. 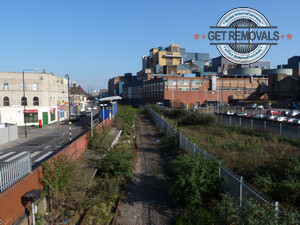 We operate in the area of Silvertown, E16. The district lies in the eastern parts of the city and is part of the London Borough of Newham. Silvertown isn’t home to any major landmarks which explain why it is one of the city’s least visited areas. However due to its industrial character it is often used as a location in different British and international movie and television productions. The district is served by numerous bus routes and several nearby tube and railway stations.